Greetings scrappers! I bring you a page that I had intended to be mostly kraft colored, but as usual, the page ended up different than how I had imagined it. These photos were taken on a trip up the 395 highway. We stopped on the side of the road to stretch our legs ad photograph some cows. While there, my husband snapped these photos as well. Can you name the movie my T-shirt is from? My base paper is from DCWV's embossed kraft stack. I had intended for more of it to show through but got carried away. 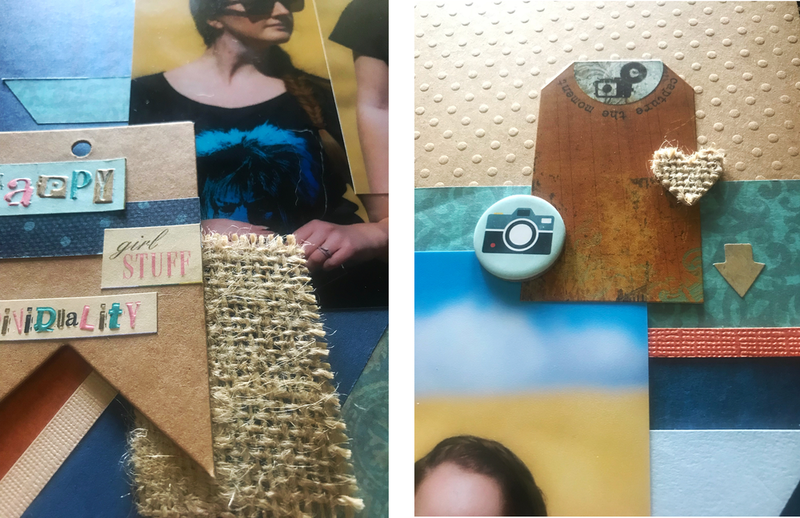 A strip of blue wood grain paper from Paper Studio's Entirely Textures stack contrasted nicely with my photos while picking up the blue tones in my shirt. Assorted scraps in blue, teal and terracotta add visual interest. With so many colors and patterns, I only used a few embellishments, like a kraft chipboard tag decorated with Studio K Words and Phrases stickers, and a terracotta tag from Bo Bunny's Mama-Razzi sticker sheet. This page was done for the Kraft Plus August challenge which was inspired by terracotta tones. I found a color palette on Design Seeds that I really liked and works well with the kraft. Scrap Our Stash was hosting another Blend A Sketch challenge for the month of August. I used the layout with three photos but turned it on its side to work with my vertical pictures. I loved the diagonal stripes in the first layout but wanted the kraft background to show so I only striped a third of the page. I included one little arrow can you spot it?